Gerry Myers died early Sunday morning after a long, beautiful, vibrant life. She brought joy to those she met and exhibited the character of Christ throughout her ministry. The Myers family will receive friends Saturday from 12:00-2:00 p.m. at First Baptist Church of Oak Park. A memorial service will follow at 2:30 p.m. at the church. Private graveside services will follow. 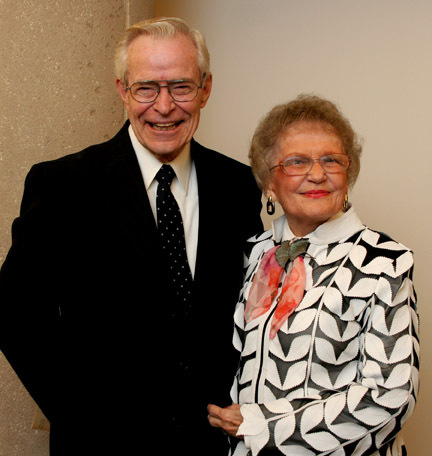 Memorial gifts may be made to the William R. and Geraldyne B. Myers Professor of Ministry Chair or the Myers Scholarship fund at Northern Seminary. Gifts may be made online at www.seminary.edu. Select “Other” under designation and write “Myers Chair” or “Myers Scholarship”. Gifts can also be mailed to Northern Seminary, 410 Warrenville Road, Lisle, IL 60532. Providentially, while many from the Northern community gather to celebrate Gerry’s life, another Northern graduate, Sarah Becker, will be ordained to the gospel ministry. I think of no finer tributes to one of Northern’s First Ladies: remembering her life and ordaining a woman to ministry.